The leatherbacks are here! The state of California’s first official Pacific Leatherback Conservation Day on October 15 comes at the peak of the season for leatherbacks feeding on jellyfish along the state’s coastline. As many as 300 endangered leatherbacks swim the coastline every year in search of jellyfish. While many threats to the survival of the critically endangered sea turtle remain, California’s coast is today a safe haven for this ancient marine species. So far this year 16 sightings of the elusive leatherback sea turtles along the Central California coast were reported by whale watchers, fishers and researchers to the Leatherback Watch Program, a citizen science program organized by Turtle Island Restoration Network (SeaTurtles.org) in Olema, CA. The Pacific leatherback sea turtle swims 6,000 miles across the Pacific Ocean to feed on jellyfish that are abundant along the California coast during summer and fall months. Sea turtle biologists using satellite-tracking tags discovered only in the past decade that these leatherbacks migrate to our coast from distant nesting beaches in remote Indonesia, Papua New Guinea, and island nations in the Western Pacific. These trans-ocean travelers are most abundant in the summer and fall but have been sighted offshore of California year-round. On Sunday, October 13th, the Leatherback Watch Program is going out once again to search for leatherbacks on an educational expedition from San Francisco Bay to the Farallon Islands. Anyone can join the day-long cruise in the heart of leatherback habitat. Get the details here: (http://www.seaturtles.org/plcd). The Pacific leatherback sea turtle was designated California’s official marine reptile last year. 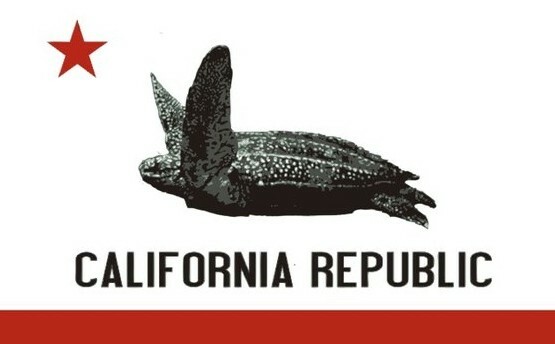 The passage of the California Marine Reptile Bill in 2012 (AB 1776-Fong sponsored by SeaTurtles.org) designated Pacific Leatherback Conservation Day on October 15 every year and prioritized conservation of this critically endangered sea turtle species. The new state law also calls for increased education and outreach to schools and all Californians about the importance of leatherback sea turtles along our coast. To help spread the word about leatherbacks and how to protect them, we recently launched the Leatherback Conservation Pledge, urging Californians to make a promise to take steps to help protect leatherbacks by swearing off seafood with high turtle bycatch, reducing use of plastics and educating others about the leatherbacks that swim the California coast. A new Leatherback Conservation Activity Guide, Facebook page and other free educational materials are now available for free at http://www.seaturtles.org/plcd. To promote hands-on conservation and collaboration, we are also thrilled to be bringing together sea turtle scientists, advocates and policy makers from both sides of the Pacific for the first Pacific Leatherback Sea Turtle Conservation Summit in Monterey next week. The goal is to create a new conservation partnership across the ocean to ensure that leatherback sea turtle populations survive and thrive both on nesting beaches and in the ocean waters where they spend most of their lives. The summit will engage over a dozen Indonesian delegates from the state Papua Barat, Indonesia, with California state officials from the Department of Natural Resources and elected officials including Assemblyman Paul Fong. Top leatherback researcher Scott Benson from Moss Landing will share his vision and experiences tagging sea turtles. Click here to view his landmark study published in 2011 in Ecosphere. Indonesian researcher Ricardo Tapilatu will bring his knowledge from the nesting beaches. Download his 2013 study about the decline of nesting leatherbacks here. Pacific leatherback sea turtles are “living dinosaurs,” having survived 100 million years virtually unchanged. The leatherback is the largest, deepest diving, and fastest swimming of all the seven species of sea turtles in the world. The largest adult leatherback ever recorded grew to nine feet long and weighed over 2,000 lbs.! It is the only sea turtle species with leathery skin and ridges on its back instead of a hard shell. Today, this ancient ocean dweller is critically endangered and at risk of extinction. 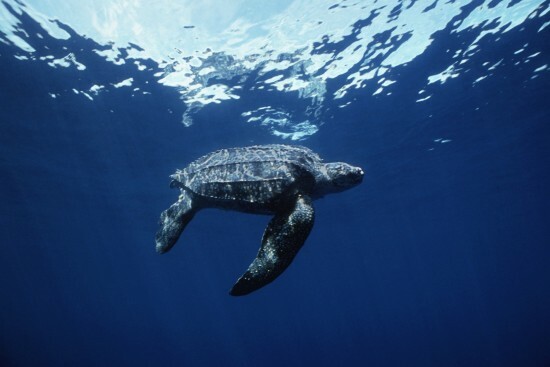 Pacific leatherback sea turtles are among the most imperiled of any sea turtle population in any ocean basin on Earth. Their population has declined by approximately 95 percent in the last 25 years. This drastic population decline has resulted primarily from human activities such as capture in fisheries, poaching of eggs and adults, habitat loss, marine plastic pollution and climate change. The leatherback sea turtle was listed as endangered under the U.S. Endangered Species Act in 1970. Increased awareness, education, and conservation policy enforcement is needed to ensure the continued survival of the Pacific leatherback. In a significant conservation victory, nearly 42,000 square miles of ocean waters along the U.S. West Coast were designated as protected critical habitat under the U.S. Endangered Species Act, including 16,910 square miles of California’s coastal waters. The Pacific leatherback critical habitat is an area where leatherbacks feed on jellyfish. Jellyfish are the main food source for all leatherbacks. They eat several hundred pounds of jellies each day when feeding in their critical habitat. Without a safe haven to feed, they could not survive their migration back across the Pacific. This Pacific leatherback critical habitat is the largest protected area for sea turtles in U.S. conservation history. Pacific leatherbacks have been protected from the California drift gillnet fishery since 2001 with the Pacific Leatherback Conservation Area. 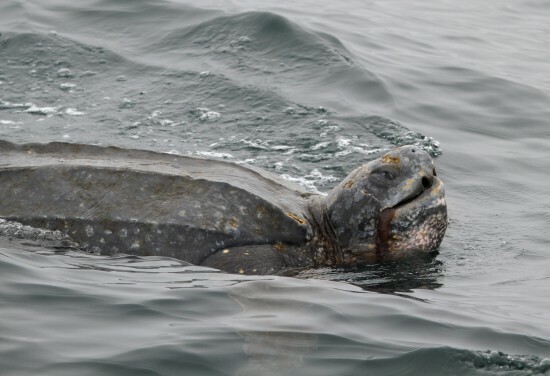 The Pacific Leatherback Conservation Area prohibits drift gillnet fishing between August 15 and November 15 along the California and Oregon coasts from Point Sur to Lincoln City, Oregon, out to the 200 mile Exclusive Economic Zone. The PLCA has reduced the number of leatherback entanglements in the fishery from 112 between 1990 and 2001; to two between 2001 and 2012. Take the Pacific Leatherback Conservation Pledge! ← Bremerhaven Didn’t Go Our Way, But Hope Is Alive!